Ireland's Katie Taylor aims to make a successful first defence of her WBA world lightweight title on Wednesday before unifying the division in 2018. 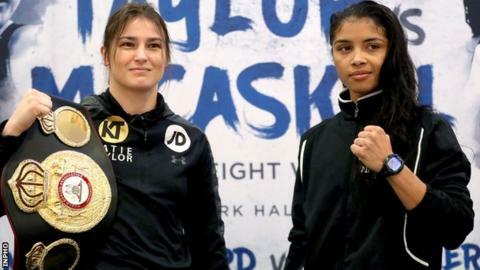 Taylor, 31, tops the bill at York Hall in London against American Jessica McCaskill after beating Anahi Sanchez to land the WBA belt in October. "I didn't think it was going to happen this quickly that I would headline a card," Taylor said. "My aim is to win to set me up nicely for a big, big year in 2018." Taylor, who won an Olympic gold medal at London 2012, has won all seven of her fights since turning professional in October 2016. She claimed the WBA title at Cardiff's Principality Stadium but is now relishing the prospect of fighting at the famous, compact Bethnal Green venue. "This is the sort of platform I've always wanted where I headline my own show," she said. "It's such a wonderful card to be boxing on in such an historic venue. I really can't wait." McCaskill, 33, has won five of her six professional contests. "A lot of the good things you see about Katie Taylor are in highlights," said the Chicago boxer, who will be fighting outside the US for the first time. "If you watch the actual fight there is a lot of mistakes. There are opportunities there and I intend on taking advantage of that."